There will be one more series this year, in which producers want to focus on the younger children of Year Six. Ms Gilchrist said: "We have to not confuse our own nostalgia for something that we loved for something that children will want nowadays. "We think we have got a lot of exciting new shows coming up that will please them and challenge them equally as well as Grange Hill did in the past." 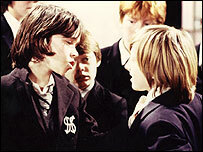 Grange Hill's creator Phil Redmond was reportedly unhappy with the strategy and felt the programme was losing its gritty purpose. "I don't like keeping things going when the point has been lost," he told the Observer recently. "I do now think the point of Grange Hill has been lost, and 30 years is a nice time for it to hang up its mortar board." The show's most controversial story was in 1986 when Zammo Maguire began taking drugs. It led to the Just Say No campaign and a top 10 single. But it was not all gloom and doom. Gwyneth Powell, who played headmistress Mrs McClusky from 1981 until 1991, said: "I don't think Grange Hill was just about issues; it was about characters, there was lots of humour in there and I think it was a very entertaining show. "Most people watched it for the fun." It was also a nurturing ground for young talent. Among its stars were Todd Carty, Susan Tully and John Alford. Jon East, head of CBBC Drama, said: "For 30 years, Grange Hill has become a byword for realistic and contemporary children's drama. "It's now time to apply what we've learned over the years to some of the new ideas we're exploring." The BBC has announced a series of new shows to fill the gap. They include Half Moon Investigations, about wrongdoing in the school playground, and Paradise Cafe, described as a beachside mystery with a supernatural twist. There will also be We Are Family, following a family who are the house band on a talk show, and Roy, about a cartoon boy marooned in the real world. This was an iconic programme, I was a young girl when I used to watch it in the eighties and it taught me things about drugs and teenage pregnancies that I didn't get taught at school. In those days we didn't have the internet and the wide range of television programmes we have now, also the subjects they covered then were more taboo so they were cutting edge. This show started around the same time I started secondary school... it scared the hell out of me! I'm glad it's going! Yet another school to close. The parents should lobby their local MP to keep it open. I blame the government. Flippin' 'eck! What would Tucker have made of this? A real shame to lose this programme, I'm 39 and use to love this series and followed it into my 20's. It has to be said though, that the age group that this is aimed at would think the antics shown are very tame by today's standards and most kids aren't shocked by such things as the Zammo drugs storyline as they see it in their school as an everyday way of life and lets face it we can hardly have some of today's activities shown in an afternoon children's programme. Bring back Gripper, he'd sort them out!! Will Mr Bronson's (played by the incomparable Michael Sheard) wig go on display somewhere? Grange Hill had it's heyday during the days of Zammo and the "Just Say No" campaign. Has there been any memorable characters in the last ten years or even memorable storylines? Phil Redmond is right - time to move on, the show has had an incredible history and long may it be cherished. What a shame they are axing Grange Hill. I remember watching it from day one. It was all we talked about in the playground at school. The story lines were true to life and we could relate to them. The lives of children may have changed but one thing remains constant - school! Too bad the BBC can't use Grange Hill to examine the lives kids lead these days. Presumably there will be some 30 second attention span series brought in to replace it. Children need good drama that reflects their lives. Grange Hill did just that. Oh dear! This shows how out of touch I am. I actually presumed it had finished years ago. I remember watching Grange Hill in the mid-90s and although I was only a child, I could understand some of the issues that were portrayed in the riveting story-lines. Grange Hill is an amazing program. I am 23 now and have watched Grange Hill for years! It's true to life and covers so many teenage issues. Why get rid of a program which is entertaining and informative!? Yea axe it I say. But let's have some classic old episodes repeated on TV. They have never been shown to my knowledge. Why not? It is an absolute classic and will make adults happy as well as kids. Fun for all the family. Bring the viewers in and let's have a re-run of the old episodes and the old series. Such a good show when I was a kid. Tucker, Gripper, Michelle Fowler, and what about the PE Teacher in the old school green Adidas tracksuit. Not to mention Mr. Bronson and that syrup of his! Quality characters and great storylines. I feel that the BBC have been fighting a losing battle to keep Grange Hill running. Life in school has changed a lot from the days of Tucker Jenkins and any attempt to reflect this would be classed as glamorisation of hoodie culture by the critics. Things have changed too much in both education and society. If Grange Hill were to reflect the lives of teenagers today it would need to be shown after the water shed and not during children's prime viewing slots. I believe that the BBC is right to end Grange Hill. It does not have the same edge that it had when it first came out in 1978 and should be allowed to bow out gracefully rather than be dragged on and be thought of as 'old fashioned'. I grew up with Grange Hill and I am sure that there are many children today who find some aspect of the drama meaningful to them, but there are so many other opportunities to reach out to children without Grange Hill, that I feel it is the right decision now to finally close the school and let us live with the memories of our 'school days'. Growing up as a child in England, one of the very few shows that were watched and discussed with friends or within the confines of the real classroom were common place. I think it is a bit odd that CBBC would axe such a long running show due to 'changing lifestyles' instead of using its creativity and experience to change the show accordingly. Its not an overhaul, just an adjustment. They should do a spin off series focused around the corner shop down the road where every kid seems to hang out these days. That would keep it bang up to date. I'm split. Grange Hill was a major part of every 20-30 year old in the UK. I remember being a kid watching in shock as Danny Kendell died or when Zammo was on drugs and a hundred other excellent Storylines. However recent years since it moved to Liverpool the show lost its way. Grange Hill was a inner city School when i was a kid and you could relate to everyone. McClusky, Bronson, Tucker, Gripper, etc but it jumped the shark about 5years ago. Hope the BBC give it the Doctor Who Treatment maybe leave it for a few years and bring it back to London in a blaze of publicity and decent actors. Definitely. Grange Hill will never be as cutting-edge and excellent as it once was. It started going downhill in the 1990s and like Top of the Pops it lost its appeal a long time ago. This is scandalous! I've watched Grange Hill for 28 of those 30 years and don't know how I'm going to cope without it. I've learned the lessons of life with those kids and passed on the message to my own kids. Please CHANGE YOUR MIND!!!!!!! !